We used to buy a lovely beetroot chutney but sadly it was discontinued by Sainsbury’s supermarket. This home made version, however, is even better: both sweet and spicy. Beetroot is readily available in our local market at the moment so I made a batch to take us well into the winter. It has to mature until the start of December, but I will probably have to hide it otherwise I am not sure how long it will last. It is lovely with cheese or cold meats, both in a sandwich or served on the side. This is yet another recipe from my favourite little book, A Pocket Book on Pickles & Preserves: techniques, hints & recipes by Olive Odell. I have cut the amount of vinegar slightly as it took a long time to reduce. If the chutney is reduced for too long the sugars start to caramelise and you risk the chutney having a burnt flavour. 1. Wash the beetroot, cover with water and cook, unpeeled until just tender (45-60minutes). Drain, cool, peel and cut into cubes (or mash if you prefer for a smoother textured chutney). 2. Place onions in a pan with 150ml/¼pt of the vinegar and cook until soft. Add apples, sultanas/raisins and continue cooking until the apple is soft. Add the cooked beetroot, ginger, salt and the remaining vinegar. 3. Simmer gently until thick and you can draw a channel through the chutney. Stir in the sugar, dissolve and continue cooking until the mixture thickens again. 4. Wash the jars well and sterilise. I usually do this by filling the jars with boiling water and putting the lids in a bowl of boiling water. I pour away the water just before filling each jar and immediately take the lid from the bowl and screw it on. 5. Pot into the prepared jars. Cool and label. Store for four weeks to mature before eating. my daughter and i made this sweet beetroot chutney on bank holiday monday it said in the recipe to leave for 4 weeks to settle it was so lush we have nearly eaten all the jars we made we are going to make more this weekend for christmas hope we can keep it that long this time.Thank you for a lovely recipe. I want to make this beetroot chutney, but what sort of vinegar is used? I have amended the recipe so it is clearer, but the original recipe was for ordinary malt vinegar and I used a good quality supermarket own brand (though I decided not to use the value brand). I used brown as this is a dark coloured chutney but white malt would be fine too and I see no reason why wine vinegar could not be substituted. Hope this helps and you enjoy the chutney. Thanks for that. I have used malt vinegar. I ended up with a small amount that would not fit into the jars I used, so my partner and I had this as a taster with some cheese and crackers …….oooh its really nice, four weeks is such a long time to wait don’t know if I’m going to make it! I also became rather protective when my partner suggested giving some away to friends and family. I think I could be making another batch pretty soon. Glad you both enjoyed this, Shaz. Beetroot is a particular favourite of my husband too and he loves this. Must buy some when I am next in our market as we have run out and he gets withdrawal symptoms! My pleasure, Wendy. Thank you for adding to my comments. It’s good to know when people have enjoyed my recipes and I am sure it helps other readers too. If you are desperate for more beets, I am sure you could beg, borrow, steal – or buy – some more! Hi, Just finished bottling. How do you suggest we store these? Garden shed, pantry, attic. if you could let us know. Hello again, Wendy & Alison. The recipe in my original book doesn’t give any specific instructions. A dark, or darkish place that is not too warm would probably be a good idea – I put mine in a low cupboard in my kitchen. Generally recipes recommend that chutneys be kept in a cool dry place away from direct sunlight. Hope that helps. PS If you enjoyed this you might well like the Damson Chutney I mentioned in reply to Shaz – and also our favourite Tomato Relish! A walk in pantry? I am soooo envious! Another vicar’s wife I know has one so perhaps our next vicarage will have one – I hope! Yes, I put my hand up, hubby is a vicar. I don’t recognise the name of your vicar, but then there are a lot of them around! As they are whole in the jar they are very pretty to look at too. I think I may well be making them for presents next year, providing I can be organised early enough. Best wishes – and thank you for continuing to visit and update me! It’s so funny that this recipe came through my inbox today. We have been reading Animal Farm and there was mention of a vegetable we didn’t know of. It turned out to be beetroot by another name. This looks interesting. How strange! I’d be interested to know the other name given to beetroot in the book – I thought that in the USA they were simply known as beets. There are all sorts of differences in the names of vegetables (our courgettes are your zucchini, our aubergine is your eggplant, etc) and even in the UK some of the names are regional. Swede, a largish yellow turnip is called simply turnip in parts of the UK, but in Scotland it is called Neeps and eaten with Tatties (potatoes). just in the process of making this recipe, have lost an old recipe that i used last year. i cant wait to try this. but can i use brown sugar in this recipe. Welcome, Jenny. I have not tried brown sugar, but have no reason to think that you cannot use it in this recipe. In a cake it usually gives a slightly different flavour – as this is a dark pickle the colour will not be affected. Hope this helps and you enjoy the pickle as much as your previous recipe! Have just commented on this gorgeous chutney at the end of the Tomato Relish ! – how foolish I am. Will say (once again) that having just made the beetroot chutney for the first time, I will be filing the recipe away to use again – and again. I just tasted it off the wooden spoon (I know, I know….) and it’s so spicy and delicious, and fabulous ruby colour will be truly festive around Christmas time. Friends and family will be receiving jars in their hampers this year. Wonderful recipe. Thank you Jenny. As I said in the message you left with the Tomato Relish recipe I am very flattered (though the recipe did come from a book – I can’t claim to have invented it) and I hope that your friends and family enjoy it. Thank you for visiting and leaving such a positive comment. (Don’t worry about posting your original comment in the wrong place – I have put in some links.) I hope you will find more you like on my site – you can subscribe on the right hand side of this page and WordPress will deliver to your email address. I just made this today and it’s amazing! I halved the recipe as I wasn’t too sure about it and I added fresh ginger rather than dried as I prefer the taste. Even just sampling it before it has cured it tastes wonderful and I can’t wait to try it with some cheese. I have loads of beetroot ready in the garden so will definitely be making some more; perhaps with a few chillis put in from the greenhouse for good measure. Thanks so much for sharing this recipe. PS Lucky you to visit such wonderful places on your travels – makes my little recent trip to France & Spain seem rather tame, though it was a great trip! Have just made a batch of this delicious chutney following your exact recipe, how long bcan it be stored for? Welcome Brenda: Yet another thumbs up for this great recipe – thanks for letting me know. Afraid I have no idea how long it will keep as it goes very quickly here and I never make larger quantities as I find they burn before reducing properly. (Once bitten, twice shy!) I can only suggest that you hide a small size pot and try it again after, say, a year. Perhaps I ought to do something similar when I next make a batch… Please do report back if you have a comment on storage that will help others. hi there, its Wendy & daughter again. We are going to be making your wonderful beetroot chutney again this year. So we would just like to say a very big thank you for such a wonderful recipe. Hello again Wendy & Alison and thank you. This chutney seems to have collected a fan club! We are on our last jar and I am thinking of trying a variation for a change – either Beetroot & Ginger or Beetroot & Orange. The jury is out at the moment but I will ask OH to choose as he eats most of it! I will post a recipe in due course if it is good…so keep watching! I am in the midst of making this yummy chutney and wondered roughly how long it needs to simmer before adding the sugar???? Hello & welcome Emma – thanks for your question. The length of time really depends on the fierceness of heat and thickness of saucepan, so it is difficult to be exact. I am not sure I have ever looked at the clock. As the recipe says: ‘simmer gently until thick and you can draw a channel through the chutney’ so as long as the fruits don’t burn onto the pan I usually leave adding the sugar until quite late as once you add it any chutney starts to darken as the sugar caramelises and is more likely to burn before thickening. Sorry not to be more helpful but I do hope you enjoy this lovely recipe. Thank you Wendy & Alison. So glad you are still enjoying the Beetroot Chutney – my most commented on post and one of the most viewed. A very happy New Year to you both as well. Hi, I was referred to this recipe by a friend and it is hugely popular with family and friends. 5lb will rarely last for four weeks, though. Useful tip on not trying to double up on quantities – I’ve made that mistake in the past. Welcome Martin & thanks for your enthusiastic comment. It’s good to hear of yet another ‘satisfied customer’ for this great recipe! hi…I think that we have collected enough jars again this year to make your delightful beetroot chutney..so many comments again about it..have passed the reciepe on to so many people you wouldn’t believe..so many thanks again for this wonderful reciepe. Do hope you enjoyed it as much as us and the others who have commented. We had this chutney with our cold ham last evening……. BEAUTIFUL is all I can say. Now making some more on a very wet Boxing Day!! Another satisfied ‘customer’! Best wishes for Christmas to you too. So glad you like this. It is the most popular I have added here and justifiably so! Hi there, have just found your recipe for this yummy sounding beetroot chutney. Am going to have a go at making it tomorrow, but just wondering what type of sugar do I use, granulated or jam sugar ? This is chutney not jam so granulated sugar is fine. You don’t need extra pectin as there will be plenty from the apples so jam sugar would be an unnecessary expense. Hope you enjoy this lovely chutney. Hello again. Thankyou for the reply about the sugar. I made a batch of this today, my first ever attempt at making a chutney!! We had a taste and it is lovely (not sure it will last the 4 weeks to mature). Always good to have positive feedback after a query. I am glad you like the results. Enjoy! Just made this chutney today and it is looking good. Had some beetroot and chutney is handy to use on the side of a salad with cold meat ove the next few months. One jar already promised to a friend. Thank you for this easy to follow recipe. Do make jam sometimes especially Damson. Will have a go at damson chutney next year and hopefully there will be a better crop of damsons. Thank you Brenda for another thumbs up for this great Beetroot Chutney. The Damson Chutney is deliciously fruity and spiced and wonderful at Christmas. Do hope you have enough fruit to try it next year. Could probably try it with another dark plum with a good flavour – won’t be exactly the same but sure it will be good nonetheless. Please could you confirm that the recipe is 3 TABLESPOONS of ground ginger?! I have looked at lots of other recipes and they seem to use a lot less ginger. Am in the process of cooking this now and have chickened out and have used 3 TEASPOONS of ginger. Hope I haven’t ruined it. Welcome – always best to ask. The amount given is correct. Remember you are making more than one jar so it is not a huge amount. There have been lots of positive comments for this recipe and no one has queried it before so everyone else must have gone with the recipe amount. I am sure you have not ruined your chutney though, it will just be less gingery than it could be which is a matter of taste anyway. hi i dont know if you can help but could i use sugar free jelly instead of sugar? You would never use a jelly of any sort to make chutney. The thickness comes from the reduction of the sugars and fruit liquids. I suppose you could experiment with sugar alternatives but otherwise it is not really chutney, just a fruit puree with added vinegar. Have just found you, when searching for Beetroot Chutney, have made it today with my home grown beetroot, the taste just from the spoon and pan is absolutely gorgeous, even our daughter who dislikes beetroot had a taste and can’t wait for the four weeks to be up, thank you very much, I am looking forward to trying some of your other recipes. 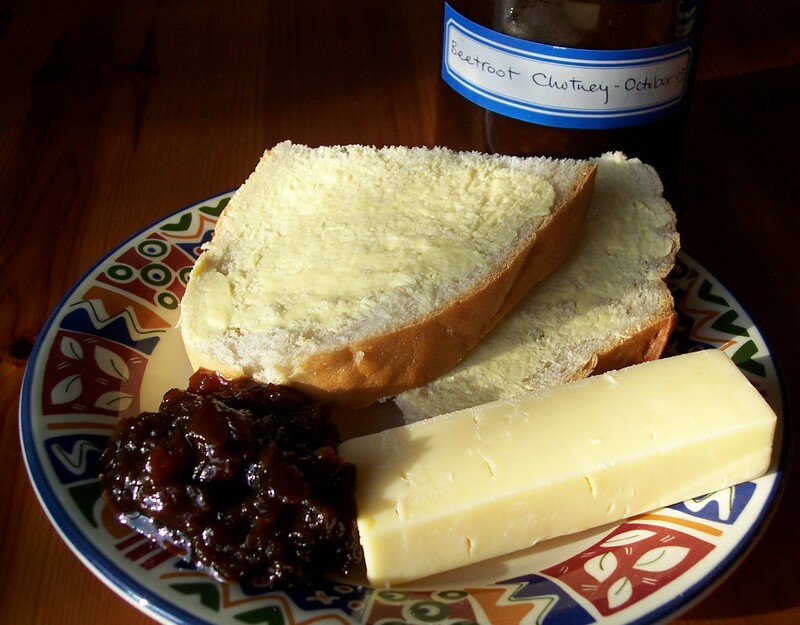 Thank you Doreen – glad this recipe has another fan and hope you enjoy the chutney. Thank you Gemma – glad this recipe has another fan and hope your friends enjoy the chutney too. What apples do I use though ? Are Bramleys ok? I usually use Bramleys for this recipe – windfalls are good – but I have used sharpish flavoured crisp eating apples too and they are fine. Depends on what is available at the time. Do hope you enjoy this popular chutney as much as we do. About time I made another batch! are the quantities of beetroot and apple after peeling/ coring or before? Quantities given are usually before peeling, etc. unless indicated and are so in this case. I don’t think accuracy is over important though so don’t worry if you are slightly short of beets as you can increase the apples or vice versa, so long as you keep roughly to the quantities. If my apple is slightly too large I still would put it all in! Just making my annual batch of this truly wonderful chutney. As mentioned by others, even beetroot haters love this and are asking for more jars ! The best chutney recipe I have ever made – and yes, you DO need all that ginger. Love this website, homely and comforting. Should be ready just in time to go with the Christmas cold cuts. Enjoy! Hi, thanks for this, I am going to try it tomorrow :) Will refer back to you if I post on it. Do hope you enjoy the chutney. Afraid I have no idea as I haven’t tried it but don’t see why not. Most new recipes come from experiments after all. Suggest you try a smaller quantity. Have fun and let me know how you get on. Hi does this recipe require fresh ginger powder 3 tablespoonful? Yes Eva, the amount is correct even though it seems a lot. Ginger powder though not fresh ginger and though I see no reason why fresh ginger could not be used you would have to experiment with quantity. This is a popular post with lots of positive comments. Hope you enjoy the chutney too. I used your recipe for tomato relish last year and it has been loved so much by the family I am making some more this year. I am going to make the beetroot chutney as well, can you let me know if this recipe needs all of the sugar as it seems a lot compared to other recipes for instance the Spiced Apple Chutney. I have always made it as per the recipe, as I expect have the other commenters here. I can only suggest you adjust a little if you wish and see what happens. I’d be interested to know as always like to cut sugar intake where I can. You will obviously get a smaller quantity. I thought that there was too much sugar too so I have made it a couple of times now with HALF the quantity of sugar and it has been absolutely fine. Fresh beetroot is naturally very sweet anyway. This is the sort of comment that is useful to have! I’ll try it myself that way as I prefer things less sweet myself. I just copied in the original recipe.